We are a busy and active congregation, with a wide range of ages, backgrounds and nationalities. For more details of what goes on at Christ Church Lille, please use the links below. Most activities slow down or stop out of term time, so please check dates and times with the organiser. The Reuilly agreement with the French Lutheran and Reformed Churches. In 1999 the General Synod of the Church of England welcomed the Reuilly Common Statement calling for a closer relationship between the Anglican Churches of Britain & Ireland and the Elgise Réformée (a grouping of four French Protestant Churches, namely the Lutheran and Reformed Churches of France and the Lutheran and Reformed Churches of Alsace and Lorraine). The provision allows for a much closer degree of fellowship (though not the interchangeability of ministers) and commits the signatory Churches to work for the goal of full visible unity of the Church. The Agreement was signed in Canterbury and Paris in the summer of 2001. A copy of the agreement can be found at this link. 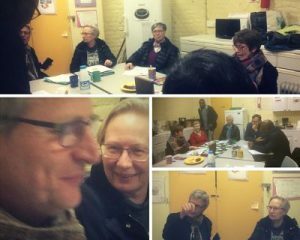 In the spirit of this close fellowship, Christ Church Lille is working with the Eglise Protestante Unie de France in Lille to work together more closely on joint projects. We held our first joint church council meeting in February, and both churches are working on projects for students and young professionals. At Christ Church Lille, our C3 café has started and will be held on the 3rd Saturday of every month. It is promoted in both churches, as well as at our neighbouring Roman Catholic student house. At the EPUF, they will be holding a monthly meal and discussion event, and we working together with them on this too.